The campus was buzzing with anticipation of Homecoming Weekend, but before that fanfare, in a small corner of campus, another celebration was happening. The Proudian Interdisciplinary Scholars—an academic honors program with a reputation for dynamic outcomes—took a moment to mark its 40th year and celebrate those who helped it become and remain a reality. 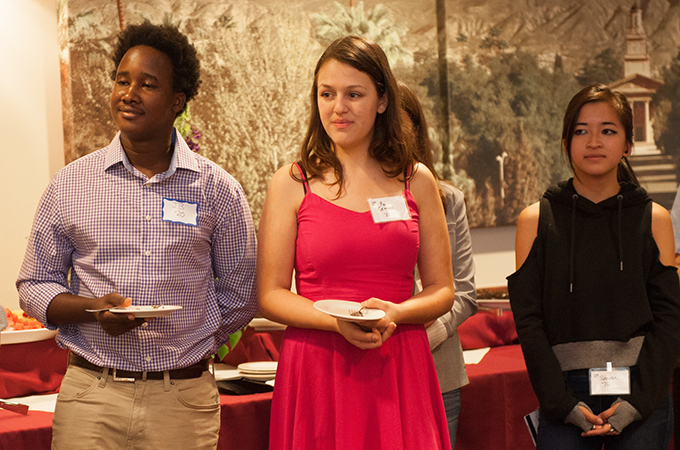 Students, alumni, and faculty gathered at the University Club for the celebration. Proudian alumnus, former program student assistant, and current Alumni Outreach and Involvement Coordinator Joe Bruner ’16 championed the event because he and other scholars—past and present—wanted to see the interaction they enjoyed with peers during the program continue between current students and alumni. The Proudian (pronounced prood-ee-uh-n) program chooses a cohort each year of 12 to 15 sophomores who wish to explore interdisciplinary study as part of their U of R experience. Dr. Kathy Feeley, professor of History and program director, explains it best. With a big smile and perhaps shedding a tear or two, Feeley, who currently serves on the Media and Visual Culture Studies Program advisory group and formerly served on the Women’s, Gender, and Sexuality Studies Program advisory committee, appeared nostalgic as she thanked the students, colleagues, and those directors who led before her—founding director Jim Hester, 1977-1982; Bill McDonald, 1982-1999; and Daniel Kiefer, 1999-2016. The recently selected Proudian Class of 2020 includes: Brandyn Alvarez, María Paula Cevallos Crespo, Margaret Eronimous, Drew Garbe, Rochelle Jordan, Jean Baptiste Kwizera, Maxine Mchunguzi, Giselle Martinez, Hiba Salih, Kristen Sauceda, Margaret Sherline, Hannah Shimizu, Tracie Spann, Sharon Tso, and Anastasia Wright.